Indiana Woodward photographed by Nathan Sayers for Pointe. This is Pointe's April/May 2017 Cover Story. You can subscribe to the magazine here, or click here to purchase this issue. Last December—a few days before her 23rd birthday—Indiana Woodward did a quick barre backstage at Lincoln Center's David H. Koch Theater. In the purity of her port de bras and articulation of her cambered feet, she epitomized Russian-style elegance. Then she removed her warm-ups and suddenly looked more French than Russian, her pastel practice tutu and black choker evoking Degas' paintings. Rehearsal began, and as the music gathered speed, she transformed again. Sweeping headlong across the stage, buoyant and boundless, she was pure New York, pure Balanchine. Born in Paris and trained in Russian technique before coming to the School of American Ballet, Woodward brings an unusually diverse perspective to her growing repertoire at New York City Ballet, which she joined in 2012. She's the rare dancer who can project worldly glamour and youthful exuberance simultaneously, who can toggle between the precision of the Russian style and the freedom of Balanchine's. One senses she'd make a regal Theme and Variations lead, or an eloquent Odette. But while she's had many opportunities at NYCB, she's such a natural soubrette—petite and bubbly—that we've yet to see the other sides of her artistry. Recently promoted to soloist, she seems about to fully flower. Woodward had a globetrotting—and sometimes difficult—childhood. Her South African mother danced for Roland Petit, and her French father made independent films; the two met on the set of a dance movie. Woodward was born in Paris and lived there for a little more than three years, until the family moved to Philadelphia. When she was 7, her parents got divorced. Woodward, her mother and her younger brother decamped to California. Her father resettled in Paris, and Woodward began spending summers with him there. “It was complicated," she says. Indiana Woodward in "Emeralds" from George Balanchine's "Jewels." Photo by Paul Kolnik, Courtesy NYCB. In California, Woodward trained intensively with Yuri Grigoriev, a former Stanislavsky Ballet principal and Bolshoi Ballet Academy instructor. “He was my teacher, my mentor, my father figure," she says. Intensives at the Kirov Academy of Ballet and Bolshoi Ballet Academy reinforced Grigoriev's Russian-style training. At 15, Woodward was invited to perform in a special showcase at the Bolshoi Ballet Academy, alongside top Russian students. On her way to Moscow, she stopped in New York City and auditioned for the SAB summer program on a whim. “I didn't know anything about SAB or NYCB—I was deep into the Russian style," she says. But while in Moscow, she discovered she'd received a full scholarship to SAB's summer course. Balanchine technique was a revelation. “I always loved the precision and elegance of Vaganova, but I never felt like I fit into that realm," Woodward says. “It was like I was living in a beautiful shell, and when I got to the SAB summer program, that was my place to burst out of it." She admits the transition was challenging. “At first I couldn't even imagine putting my weight in my metatarsals all the time! But I loved the push to do more, give more, be bigger, take up more space." Woodward enrolled at SAB full-time following the summer course, became an apprentice with the company after two years, and earned her corps contract in December 2012. Her technical brilliance and blithe, cheery charisma made her an immediate standout. “People have compared her to Violette Verdy, partly because of the French background, but also because the personalities are similar," says NYCB ballet master Kathleen Tracey. “Indiana has real charm. There's nothing aloof about her." Roles began coming thick and fast. Woodward proved early on, in ballets like Christopher Wheeldon's flirtatious Soirée Musicale, that she excelled as a soubrette; before long, she was one of the company's go-tos for sparkly soloist roles. “I got thrown on a lot, actually," she says. Last winter she performed the title role in La Sylphide after another dancer became injured, but nevertheless presented a richly nuanced Sylph, drawing on her Russian training as well as her Balanchinian speed and brio. “She didn't lose her mind or get nervous," says Tracey. “She had a job to do, and she did it." Indiana Woodward with Harrison Ball in George Balanchine's "Divertimento No. 15." Photo by Paul Kolnik, Courtesy NYCB. But one of Woodward's most talked-about roles—her star turn in NYCB principal Lauren Lovette's For Clara—was made on her, and reflects the special bond she shares with Lovette. The two first met in 2010, when Woodward danced in Lovette's ballet for the New York Choreographic Institute. In the years since, they've become good friends. “We discovered that whenever we hung out together, we both felt recharged," Lovette says. She made Woodward the strong, independent protagonist of For Clara, and Woodward felt a special responsibility to the role. “I was almost being Lauren, in a way," Woodward says. “I wanted to channel her. I wanted to give her all I could." That spirit of generosity extends to the company as a whole. In the studio, Woodward is known as much for her cheer-ful personality as for her dancing. “The happiness you see onstage is what you get offstage, too," Tracey says. Lovette admires Woodward's commitment to forging relationships with every member of the company, and especially her support of younger dancers, like dressing-room mates Baily Jones, Rachel Hutsell and Alston Macgill. “She's very selfless and giving," says Lovette. “Sometimes I worry she gives too much, actually." Is the perpetually sunny Woodward eager to try out less sunny roles onstage? “I do get nervous about being typecast, because I'm short and perky," she says. In fact, she'd love to dance something like the Novice in Jerome Robbins' The Cage. “I want to be creepy!" She laughs. “The only way you grow is by being challenged in different ways. And I love transforming myself." That desire to transform stems, in part, from her personal history. “I've always been changing homes, languages, cultures, and that's an appetite I have in dance, too," she says. Four years ago, she got a small tattoo of a cloud on her wrist. “When I was little and traveling between my parents, I felt like I never quite found myself. I spent so much time in airplanes that I was most at home in the sky, in the clouds. And the reason clouds are so beautiful is because they're constantly changing." 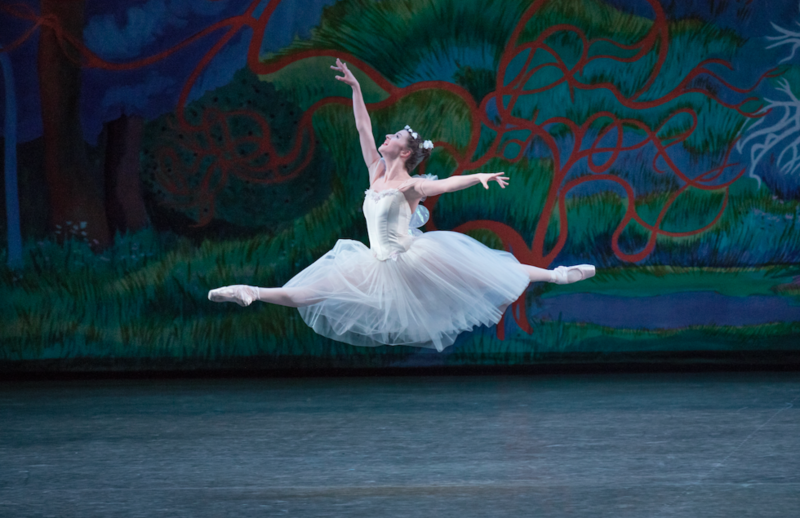 Indiana Woodward as The Sylph in August Bournonville's "La Sylphide." Photo by Paul Kolnik, Courtesy NYCB. Her promotion to soloist, which came in February of this year, should bring more opportunities for metamorphosis. Prior to the announcement, many of Woodward's fans expressed frustration at her slow progression in the company, and Woodward herself admits to having felt a little impatient. “I'm still trying to figure out how to overcome my feelings of doubt in a world where you have to project confidence, always," she says. “The mental part of the game is difficult. But I like working hard, and I appreciate every opportunity I get." Woodward makes a point of living a full life. She's an avid reader of fiction, poetry and feminist literature, and she hopes to study philosophy in the near future. She and Lovette frequently do arts-and-crafts projects together, or “put on sneakers and do 'interpretive dances' to pop songs." She enjoys swimming, yoga and Pilates, and every once in a while, she'll head to Steps on Broadway for modern or hip-hop classes. She's even taken contemporary class in Paris' trendy Marais neighborhood. “Indiana is a well-rounded person and a well-rounded artist," Lovette says. “Yes, there's very little she can't do as a dancer—but more importantly, her intentions are always pure. And that's why everyone wants her to succeed." The story of Indiana Woodward's unusual first name is both romantic and practical. Her mother, who has a mystical streak—“I grew up with fairies and magic," Woodward says—believes it came to her in a vision. “She saw a little light land on her pregnant tummy, and suddenly she knew Indiana was the name." But her parents also chose it because it's easy to pronounce in both French and English.